The Auckland region extends from the mouth of the Kaipara Harbour in the north across the southern stretches of the North Auckland Peninsula, past the Waitakere Ranges and the isthmus of Auckland to the Hunua Ranges and low-lying land south of the Manukau Harbour. The region ends within a few kilometres of the mouth of the Waikato River. It is bounded in the north by the Northland Region and in the south by the Waikato Region. The Pacific Ocean and Tasman Sea form the coastline around the Auckland region. The east coast is lapped by the waters of the Hauraki Gulf, an arm of the Pacific sheltered by a considerable number of small and large islands, most notably Great Barrier Island in the northeast. 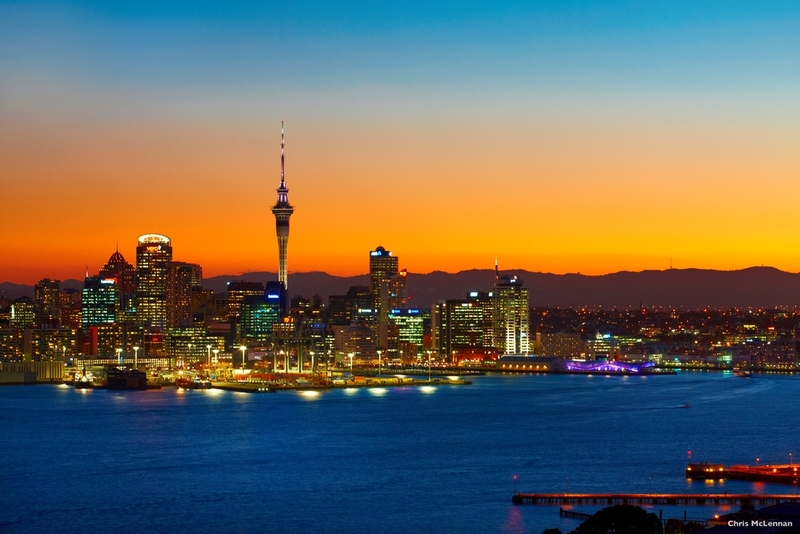 An arm of the Hauraki, the Waitemata Harbour forms the main port of Auckland city. To the west lie two large natural harbours, the Kaipara and the Manukau. Both of these have treacherous entrances and are little used by shipping. The Kaipara Harbour (of which the southern half is in the Auckland region) is one of the world's largest natural harbours, covering an area of 530 square kilometers. The region is blessed with many fine beaches, especially on the Tasman coast, south of the Kaipara. 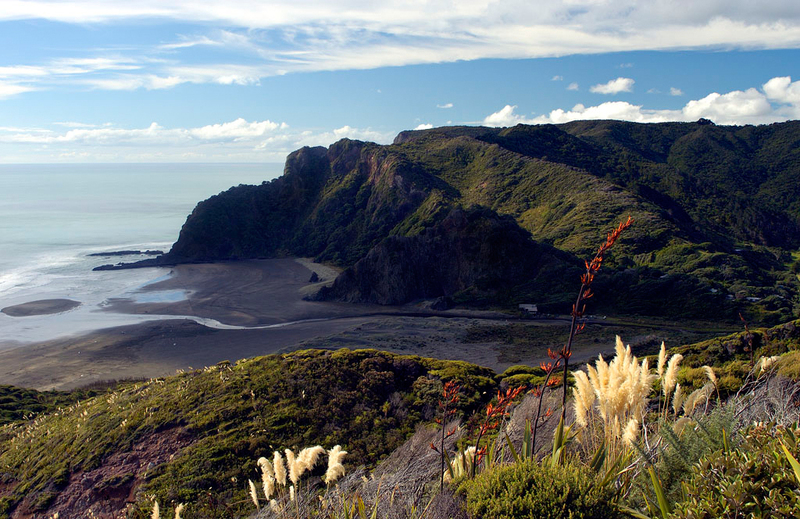 These include Muriwai and Piha beaches. To the north of the Auckland urban area lies Rodney District, which includes the towns of Helensville and Wellsford. To the south lies the district of Papakura, containing a town of the same name. Further south, the Auckland region covers the northern half of the Franklin District (the southern half is part of the Waikato region). Franklin contains the towns of Waiuku and Pukekohe. Between the rural districts of Rodney and Franklin lies the dense urban development of the region's four main cities. The Auckland metropolitan area encircles the Waitemata Harbour and extends south from the Auckland Isthmus along the shores of the Manukau Harbour. Auckland city takes up the bulk of the isthmus itself. Across the Waitemata from Auckland city lies North Shore city. 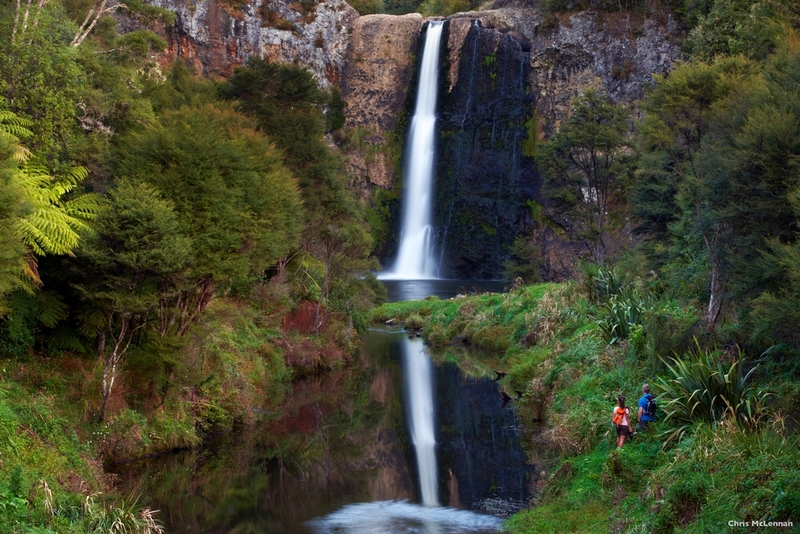 To the west of Auckland city, nestling beneath the eastern foothills of the Waitakere Ranges, is Waitakere city. Finally, the city of Manukau extends to the south of Auckland, close to the eastern shore of the harbour which shares its name. The Franklin District is a municipality to the south of Auckland in the North Island of New Zealand. The district is divided between the administrative regions of Auckland to the north and Waikato to the south. It is administered from the town of Pukekohe. The district is mainly rural with local settlements such as Waiuku and Tuakau supporting the farming industry. One industry of note is the factory of New Zealand Steel at Glenbrook, north of Waiuku. The district is bounded in the north by the start of the Auckland metropolitan area and the waters of the Manukau Harbour. A long peninsula stretches up the Tasman coast to the mouth of this harbour. To the south, Franklin is bounded by the fertile lowlands of the Waikato Plains. In the east, the land rises to the Hunua Ranges, to the east of which is the coast of the Firth of Thames. In the west is the Tasman Sea. Here are located several holiday spots such as Kariotahi Beach and Matakawau, which is close to the south of the entrance to the Manukau Harbour. The Waikato River mouth is at Port Waikato in the south of the region. This is renowned as a good place for surfcasting. The Franklin District is a municipality to the south of Auckland in the North Island of New Zealand. The district is divided between the administrative regions of Auckland, to the north, and Waikato to the south. It is administered from the town of Pukekohe. The district is mainly rural, with local settlements such as Waiuku and Tuakau supporting the farming industry. One industry of note is the factory of New Zealand Steel at Glenbrook, north of Waiuku. The district is bounded in the north by the start of the Auckland metropolitan area and the waters of the Manukau Harbour. A long peninsula stretches up the Tasman coast to the mouth of this harbour. To the south, Franklin is bounded by the fertile lowlands of the Waikato Plains. In the east, the land rises to the Hunua Ranges, to the east of which is the coast of the Firth of Thames. In the west is the Tasman Sea. Here are located several holiday spots, such as Kariotahi Beach and Matakawau, which is close to the south of the entrance to the Manukau Harbour. The Waikato River mouth is at Port Waikato in the south of the region. This is renowned as a good place for surfcasting. Manukau City is a city in the Greater Auckland region of New Zealand. While officially described as being a city unto itself, Manukau is a de facto part of the city of Auckland, with there not being any clear divisions between Manukau and the rest of the city other than administrative boundaries and some harbour inlets. The area is commonly referred to as South Auckland, but this term does not possess any official recognition and does not encompass East Auckland, which is within the official boundaries of Manukau City. The name Manukau is of Maori origin, and may mean "wading birds", although it has been suggested that the name of the harbour after which the city is named was originally Manuka, a type of native tree. North Shore City in New Zealand is one of several cities in the Auckland metropolitan area and the fourth largest city by area in the country. It is bounded by the Waitemata Harbour to the south and the Rangitoto Channel of the Hauraki Gulf to the east. The Auckland Harbour Bridge connects it to Auckland City on the south side of the Waitemata Harbour. Devonport is home to the main base of the Royal New Zealand Navy and Albany is home to Massey University's Auckland campus. The seat of the North Shore City Council is in Takapuna. Inner suburbs are: Milford, Takapuna, Belmont, Devonport, Bayswater, Northcote, Birkenhead, Highbury, Hillcrest, Glenfield, Wairau Valley, Westlake, Forrest Hill; and outer suburbs are: Birkdale, Beach Haven, North Harbour, Albany, Torbay, Browns Bay, Mairangi Bay. The bays along with several others on the Hauraki Gulf coast, are collectively known as East Coast Bays. Pukekohe is a town in the Franklin district of the North Island of New Zealand. It is approximately 50 kilometres south of Auckland, between the southern shore of the Manukau Harbour and the mouth of the Waikato River. Pukekohe is the main rural service town for the surrounding horticultural and dairy farming operations, and the economic hub of Franklin. The Maori word puke-kohe means “Hill of the Kohekohe”, New Zealand’s native mahogany. Pukekohe has a high school, a medium-sized rugby stadium (home of the Counties-Manukau Steelers), horse-racing, and the best motorsports facilities in New Zealand. Warkworth is a town in the Rodney District of New Zealand. It is located on State Highway One 64 km north of Auckland and 77 km south of Whangarei, and lies at the head of Mahurangi Harbour. Warkworth was founded in 1853 by John Anderson Brown, who named it after his birthplace, the village of Warkworth, Northumberland. Early industry included logging for kauri and other timbers, flour milling, and boat building. The first portland cement manufacturing works in the southern hemisphere was established near the town in 1884. New Zealand's main satellite communications ground station is located 5km south of Warkworth.